According to Netflix, I have a predilection for ‘mind-bending’ films and considering my love of all things David Lynch, I would say they are probably right. Which is possibly why I greeted Melanie Gilligan’s video series Popular Unrest, installed at Stills as part of two-centred exhibition ‘Economy’, with a warm sense of recognition. The characters in Gilligan’s series are brought together by the realisation of the binary relationship that isolated individuals have with each other in contemporary society. In an increasingly digital world everything from our economic transactions to our social ones are done electronically. The nature of mankind, life, and the soul boils down to numbers, like a code. Hence the real or imagined but theoretically possible threat of technology developing consciousness. In this way the quintessential question of the nature of reality can be seen in terms of digital economy. If this sounds heavy or particularly abstract, it should serve to illustrate the concerns of the curators of ‘Economy’.This is not just an art exhibition, but has political and philosophical overarching themes which not only analyse, visually, the more obscure definitions of the concept of ‘economy’ but also, using the opposing functions of pathos versus tragedy, examine how a visual image operates within this concept. Unfortunately, an iPhone camera does not do justice to AV work such as Gilligan’s. 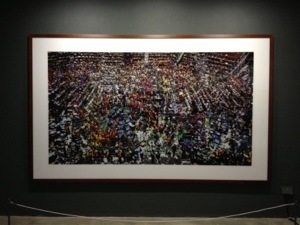 The show includes photography in addition to video pieces, including Andreas Gursky’s memorable image of the Chicago Stock exchange (see below). While this particular example may be an obvious link to the world of commerce, works such as Chinafrica by Paolo Woods subvert our traditionally eurocentric interpretation of colonialism. The content of ‘Economy’ is too broad for a singular blog post: this is a fabulous exhibition, I cannot praise it enough. It is an intelligent, deep, and wide ranging exploration of a loaded concept, not easily digested in one sitting. For me, a return visit is a necessity after an amount of time to ‘debrief’ and have a good think! I think it is one of those occasions where an exhibition possibly raises more questions than it attempts to offer explanation for, which is testament to the thorough and inspired research behind a complex and impassioned subject matter.